Indian Ecstasies: Women on Wanderlust: Wow, what a concept! I have often come across several women complaining that their spouses don't like travel so they're stuck when they want to go somewhere or do something. Even single women who want to travel face problems such as an alien and unsafe environment or the uncertainty of traveling on their own. So when I saw a small write-up in The Hindu supplement on holidays for women, I was immediately a little curious. I am a frequent traveller (as frequently as I can manage to take off anyway!) and one challenge I face is finding a travel partner. So the whole concept sounded really interesting to me. I didn't waste any time and got in touch with Sumitra Senapaty who is the woman behind WOW - Women on Wanderlust. Sumitra lives in New Delhi, and shuttles a lot between Delhi & Bangalore, where she has family. 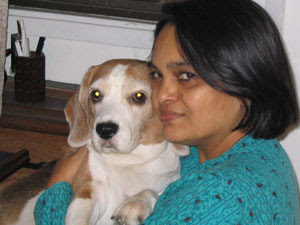 She is married with a son and daughters (teenagers) and a naughty pet called Beagle. She has travelled to several countries on assignment including: Maldives, Sri Lanka, Seychelles, Hong Kong, South Korea, Israel, Namibia, South Africa, Kenya, Nepal, Canada/Alaska, France, UK, Ireland, Switzerland, Australia, New Zealand, Austria & Prague, Turkey & Egypt. Some of her favourite places in India are Ladakh, Devbagh & Corbett. Some of the publications she contributes to are Verve, Life & Style (Outlook), Jetwings Inflight magazine, Asia Spa, Taste & Travel. I thought this would make sense to a lot of women in Bangalore, who live and work in the city and enjoys travelling once in a while, but is sometimes deterred by taking off alone. Here is the interview with Sumitra. And if you're a male reader you can do your bit too, by forwarding this to your spouses, girlfriends, sisters and even mothers maybe?! Go on, read it! 1. How & why did WOW start? As a writer I travel to various parts of India and the world for my assignments. During these trips, I notice that there are women traveling on their own and clearly enjoying it. But this kind of a thing does not happen in India, forget travel, how often do you come across a solo woman sitting in a café or watching a movie by herself? Almost never... I thought of starting WOW for solo women travel, but in a group situation, wherein safety and security are top priorities. It started in my own extended family - a couple of years back I was asked to set up and coordinate a family and friends trip to Kerala - and we were all female. We did Cochin, Munnar and the backwaters and thoroughly enjoyed ourselves... I realized that apart from tourism, what we were enjoying was 'girl time'. No matter what age, women do have the ability to bond with each other. Further encouraged with the idea, I formally started WOW during the summer of 2005 and put together not one, but three groups to Ladakh. 2. What kind of response has WOW received? The response is tremendous - women feel that this is a platform for them to interact with other women from different parts of India - they come in as strangers and depart as friends. They feel empowered - in the sense they know that WOW is something they can depend on - for great travel ideas, value for money travel packages and a feeling of confidence and well being, which traveling with WOW brings about. 3. What is the demography of the women? Do married women join in? 4. What are the frequent questions that the women ask? Who are the women traveling in the trip? Where do they belong to, what are their professions etc. How will I get along with the others - not knowing them, women wonder if it's possible to enjoy a holiday with total strangers... They also ask a lot of questions regarding the destination, details of tourist attractions, what is the weather like, what type of clothes to take, how much foreign currency is required etc. 5. Where have the WOW groups gone to so far? Ladakh, Egypt and Sri Lanka and fast approaching is the WOW trek to the Himalayas. 6. Can you share the WOW Travel Calendar? December - New Zealand - a driving tour. The domestic tours can range anywhere between 10,000 to 35-40,000 (rupees). Foreign destinations can cost between 50,000 & a lakh. 7. The advantages of traveling with WOW? Companionship, safety, reliable travel arrangements, value for money, a sense of togetherness and confidence in the fact that yes I can do a holiday on my own. Women are confident that traveling with WOW, there is safety in numbers. I don't wait for a critical mass as such, I plan an itinerary, circulate & promote it and by now I have a fair idea of what works and what doesn't. WOW is only for women - husbands and partners are not allowed. (The only exception to this will be the WOW cruise in 2007, which will include Friends of WOW as well). 9. Do women come with divergent expectations? Women join up for WOW tours expecting a whole lot of fun, frolic and above all great 'girl time.' But they do feel the need for individual moments during the trip. WOW itineraries are developed in such a way, that there is time for individual leisure as well. Stuck in a blizzard in the back of the wilds in Ladakh, en route to Pang Gong Tso. 12. Other than for good time and companionship in travel, is there any other aspect of wow that makes it attractive? WOW is a platform for like-minded urban women. 13. Any deeper friendship that has grown beyond travel? Yes, WOW does keep in touch through email and we try to meet up at least twice a year. 14. Do members tend to repeat traveling with WOW? Yes they do, some of the girls who came for Ladakh, did Egypt with WOW. Now some of them are going for the August trek as well. 15. Any ice breakers to get women easy with one another quickly? Somehow icebreakers are not needed! Women talk easily - the moment they see each other! So gals, women, what are you waiting for? If you want to travel somewhere, don't let the lack of a companion or company stop you! You can visit www.wowsumitra.com or contact me@wowsumitra.com or call 09891655054 for more. These girls are on their own trip! great! now independent females can travel safely ..
Hi Saurabh I don't think so that there shld be any problem in travelling alone. Today, females have crossed many barriers. She is independent, free and she have the power of knowledge. I can't believe it!! !WOW is no doubt a new concept. I also would like to join your gang during my forth coming visit to India. Do you allow foreigners as well to accompany you ? Kolkata is a cosmopolitan city where people, technology and ideas have blended together with the socio-political culture to give the city a new shape. Kolkata is the second largest city of India The city is full of historical monuments and palaces and is called the “City of Palaces”. The city in a short span, about 400 years, has evolved into one of the major commercial areas and a great learning centre in the sub continent. Kolkata provides enormous opportunities in economy, industry, education, culture, and tourism. The University of Calcutta is one of the oldest universities in India, which celebrated its 150 years of excellence in learning in 2006-7. Your trip to Kolkata would be an ever lasting experience because there are many interesting places to visit like Howrah Bridge, Birla Planetarium, Kali Temple, Marble Palace, Eden gardens, Botanical garden, Birla Mandir, etc. The best time to visit Kolkata is the month of September to March. Your visit to Kolkata would be further enlightened by having a perfect stay at Fortune Hotels in Kolkata. This hotels in Kolkata have 71 rooms at the hotel including 34 Standard Rooms, 23 Fortune Club Rooms and 14 Suites. These have been tastefully done up in contemporary style décor. The rooms are spacious, contemporary and smart. They boast of a carefully crafted blend of aesthetics and modern amenities and are well equipped with a complete range of amenities including cable TV, electronic safe, wi-fi connectivity, tea/coffee making facilities and much more. The business travelers would find this business hotels in Kolkata as ideal venue for conferencing, meetings, interviews, seminars, etc. The hotel offers a choice of F&B outlets. Zodiac: The 18 hrs coffee shop bringing the best of world cuisines together. The name draws from the Fortune brand itself and offers the right mix of food for people belonging to all sun signs. It offers a lavish spread of breakfast, lunch and dinner, apart from the delectable all day menu. Fortune 5000:This is a bar in a contemporary and relaxing setting offering excellent selection of spirits, wines and beers. Also serves snacks and cold beverages mocktails and savoured amid lively music. Chai Bar & Lounge: A Lounge Tea Bar with a Pastry Shop. A perfect place to relax & unwind while sipping through a selection of garden-fresh teas and organic teas in a comfortable setting.